Putting on a Trial | A.I.O.C. Holding an AIOC Club Trial The following document is intended to provide those responsible for organizing an AIOC Club Trial hosted by their club with an overview of the necessary ingredients of a successful trial. These should be viewed as suggestions only and can be modified to suit the specific needs of the club and its current situation. Throughout, references are made to the AIOC Rules and Regulations, a copy of which should be kept at the registration table in case needed. As far as possible, CKC Obedience Trial and Rally Obedience Trial Rules and Regulations will be used to govern the judging at AIOC trials. These, too, should be available at each trial. Section 6 of the AIOC Rules and Regulations highlights some of the key exceptions made to those rules and should be consulted when organizing the trial. This document is also intended to deal with happenings outside the ring and should be used in conjunction with the two stewarding guides – “Working together – A Guide for Obedience Stewards” and “Stewards in CKC Rally Obedience” which deal more specifically with what happens within the ring. The Association is set up to foster co-operation between Vancouver Island dog obedience training clubs, groups and organizations (hereinafter referred to as ‘clubs’) that provide and promote competitive dog obedience training. The Association will act as a clearing house for dates of proposed trials and tracking tests. The Association will forward a copy of the minutes of the Association meeting to each AIOC member club. 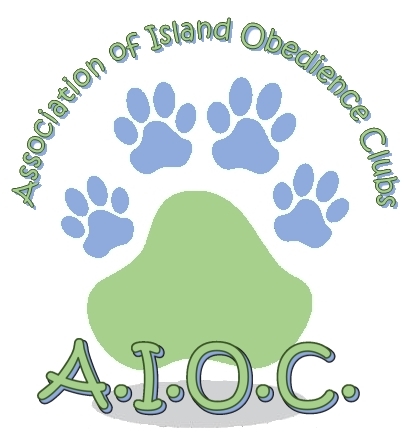 Each AIOC club will supply members with AIOC dog score cards as required. The Association will conduct meetings in April and October of each year as agreed upon by a majority of AIOC representatives. The Association will govern itself as closely as possible by the rules and regulations of the CKC. When the CKC updates or changes a rule or regulation, the Association will decide by vote if it will follow the CKC example. 1. Club dues are payable in October of each year for the next year. 2. Member clubs must agree not to publish anything pertaining to the AIOC until cleared by the AIOC. 3. Each member club must appoint an AIOC representative and an alternate delegate to the Association meeting so that all clubs are represented and all have an equal say in the Association’s affairs. The representative shall attend at least one meeting per year. a) For any recorded vote, each member club in good standing will have a single vote. b) Voting by proxy is not permitted. c) A majority vote is required to adopt a motion. In case of an equality of votes, the chairman shall not have a casting or second vote in addition to which he/she may be entitled as a member and the proposed resolution shall not pass. 4. Each member club shall take an active part in the AIOC and conform to the AIOC Rules and Regulations and hold at least one trial every two years, or the particular club involved could be expelled from the AIOC. Under extenuating circumstances the AIOC Executive has the authority to grant flexibility with regard to holding at least one trial every two years. Clubs are allowed to combine forces to hold a single or double trial. 5. In order to be considered for membership in the AIOC, a prospective club must apply in writing to the AIOC Executive, supplying the region in which the club will be active, number of members, experience of the Trainers, and a list of the Club’s executive, including addresses and phone numbers. The application will be presented at the next meeting of the AIOC and will be voted on by the members present. Applications must be received a minimum of 60 days prior to presentation at an AIOC meeting. The applicant is required to be present at the meeting and to receive questions from the AIOC representatives. He/she will then be asked to leave the room, at which time the application will be reviewed by the AIOC representatives who will consider whether the applicant’s club conforms to the AIOC Rules and Regulations, as well as whether the inclusion of the applicant will be to the benefit of the AIOC as a whole. The representatives will vote by secret ballot. A majority vote as outlined in section 2.3 is required to accept the applicant as a member of the AIOC. In the event such an application is rejected, no re-application will be considered for a period of at least one year. Only qualified CKC or AKC judges and those approved by the AIOC can be accepted for AIOC obedience or rally trials. Any current CKC or AKC Rally judge would immediately qualify as an AIOC Rally judge. If, in an emergency, a club finds itself without a licensed judge, a mock trial may be held at which anyone capable of doing so may judge, but no qualifying ribbons should be awarded, or scores toward a club degree counted. Judging fees and/or traveling expenses, if any, shall be paid by the sponsoring club. The amount paid shall be agreed upon by the sponsoring club and the judge(s). No written examination shall be conducted. A judge may compete in a class and may also judge other classes in the same trial. For obedience, active involvement in dog obedience for a period of at least five years. For rally obedience, active involvement in Rally O for a period of at least 2 years (CKC, AKC, AIOC or CARO). For obedience, three years experience as an instructor or assistant instructor. For rally obedience, one year experience as an instructor or assistant instructor in Rally O (CKC, AKC, or CARO). Written recommendation by an AIOC club in good standing. For obedience, ring steward experience in at least six club, CKC, or AKC trials at all three levels. For rally obedience, ring steward experience in at least two rally obedience sanction matches or trials in all three levels of Rally O. A minimum of one trial or match must be under CKC or AKC rules. Satisfactory completion of an oral examination by a panel of three to consist of two AIOC or CKC judges (obedience or rally O as appropriate) and one other qualified person to be selected by AIOC. If finding qualified persons proves to be difficult and would result in untimely delay in the process, a panel of two, consisting of one AIOC or CKC judge and one qualified person would be acceptable. In the event of a dispute between the judge and the knowledgeable person, after a discussion between the two, should opposite opinions continue to prevail, the final decision will rest with the judge. For obedience, satisfactory completion of three judging assignments under direct supervision of at least two different AIOC or CKC judges. For rally obedience, satisfactory completion of two judging assignments under direct supervision of a rally obedience judge. The final marking of exhibitors in such supervised trials is to be the responsibility of the certified judge. For obedience, judges must have achieved at least an AIOC, CKC, or AKC CD and CDX degree and one Utility leg or have trialed in the Utility Class. For rally obedience, judges must have achieved at least one rally obedience degree in both the Novice and Advanced levels and have trialed at least once at the Excellent level (CKC, AKC, AIOC or CARO). Formal approval by the current AIOC Executive on satisfactory completion of the above requirements. It shall be the duty of the AIOC Executive to assist the judge-applicant wherever possible in the organization of the examination by the judges and judging assignments. After passing all the steps a person must do to become a judge, there will be a probationary period of one year for obedience and two trials for Rally O. During the probationary period two AIOC obedience judges or one AIOC rally obedience judge and/or a knowledgeable person will observe and critique the probationary judge at two trials. They will not know that they are being critiqued. Each judge or knowledgeable person will complete a critique form and submit it to the AIOC Executive. After receiving two critiques the Executive will meet with the probationary judge to review the critiques (disclosure of the observer will not be made). If not successful the probationary judge will remain on probation until they have had two successful critiques. In so far as possible CKC obedience and CKC rally obedience rules should govern all AIOC dog club obedience tests or trials. Clubs holding trials must forward all passes and awards results to the secretary of the AIOC, as well as to all clubs, within two weeks of the trial. All clubs shall apply to the AIOC Executive at the April meeting for one priority (preferred) date for their club trials for the ensuing year. In the case of duplication, the decision will be made by a draw from a hat containing the names of the clubs concerned. After priority dates have been established clubs may then apply for additional dates. A club may change the date of a trial when forced to do so by circumstances beyond its control, providing the new date does not clash with that of any other club. The AIOC secretary must be notified. By mutual agreement of the clubs concerned, more than one club may hold a trial on the same date. Three weeks notice of forthcoming trial details by the club holding the trial should be given to the AIOC and all member clubs. All classes (including ‘A’ and ‘B’ classes) must be separated as far as scoring is concerned. Rosettes and/or ribbons, as well as perpetual trophies, may be awarded at trials by AIOC clubs. Keeper trophies to replace perpetual trophies when returned are permissible. Clubs hosting AIOC trials may also present prizes donated by merchants or sponsors if they so wish. The value of the prizes may not exceed $50.00 each. Clubs are under no obligation to give prizes at their trials. Prizes to be donated must be from/for the host club only. When trialing AIOC, you must start at Novice and work your way up, completing each degree before advancing to the next degree. A dog may obtain the required three qualifying scores for any class under one or more judges. A dog will only be allowed to trial under one club affiliation. b) a Rally Excellent title, which may enter Advanced B and Excellent B in the same trial when competing for an RAE title. The requirements for the MOTCH and RAE titles will be the same as provided in the CKC Obedience and Rally Obedience Rules & Regulations. The trial-giving club shall decide whether or not to allow ’exhibition only’ dogs at their trial. This should be specified on the trial notice. AIOC rules state that a dog must have completed a degree (three legs) before it can be shown as an ‘exhibition only’ dog in the latest degree finished. Exhibition only’ dogs are not eligible for class placing and/or awards/prizes from the AIOC class, but are eligible for ‘exhibition only’ awards/prizes if the trial giving club has such awards. If a dog enters two trials in one day and completes their degree at the first trial, they must be entered in the second trial as ‘exhibition only’ or move up to the next level, unless competing for a MOTCH or RAE title. Dogs entered as ‘exhibition only’ will be allowed to jump less than their normal jump height, at the owner’s discretion. Such dogs will not be eligible for any awards/prizes offered for ‘exhibition only’ dogs. Dogs that have completed their Utility degree may also be shown as “exhibition only” in the Open B class. A club holding a club trial shall follow the order of judging which it has advertised. A member of a judge’s immediate family is permitted to show under that judge. Veteran dogs, seven years of age and older, may be entered in an official class and/or a Veteran’s class. A junior handler is a person 16 years of age and under. A club may hold a junior handlers’ competition at a club trial, but that club must supply a qualified person to judge the class. The advertised judge(s) of the official classes shall not be used for this class. Junior kennel clubs may hold a correction match in place of a regular club trial. All handlers wishing to enter a trial must produce a membership card for an AIOC club. The card must indicate that dues are paid for the current year. Dog score cards are not renewable and should not be stamped for dues paid. Each AIOC member club will supply dog score cards to members free of charge. If successful at the trial, he/she will be awarded a ribbon on receipt of the missing card, by the secretary of the trial-giving club. If the winner of an award, the award will not be given and the second highest scoring dog will receive the award. The card must be signed by the secretary of the club giving the trial or secretary of the competitor’s club, upon receipt of the official scores. 1. Each club must train a suitable number of their members for ring stewards. Purpose: To honour the contribution of Donald and Molly Hudson to the fostering of dog obedience training on Vancouver Island. 1. The trophy is to be awarded to the person handling one dog achieving the highest aggregate of the three scores in any one degree, the last score to be made in the calendar year preceding the award. 2. All three scores must be obtained while trialing under one club. 3. The competitor must have been an active member of the club referred to for at least one year. 4. The trophy is not to be taken from Vancouver Island. 5. Scores must be submitted to the AIOC secretary by January 31st so that the trophy may be awarded at the April meeting. 6. A keeper trophy will be awarded to the recipient at the time that the perpetual trophy is presented. The perpetual trophy will be held for one year and returned to the AIOC executive to be awarded at the April meeting. 7. In case of a tie, the winners shall equally share in the award with regard to the number of months held, names recorded on the perpetual trophy, and receipt of the keeper trophies. Purpose: To honour the contribution of Arlene Bishop to the fostering of Rally Obedience on Vancouver Island. The trophy is to be awarded to the person handling one dog completing the Excellent level and will be based upon the highest scores earned in the first three qualifying legs in the lowest combined time. The last score to be made in the calendar year preceding the award. All three scores must be obtained while trialing under one club. The competitor must have been an active member of the club referred to for at least one year. The trophy is not to be taken from Vancouver Island. Scores must be submitted to the AIOC secretary by January 31st so that the trophy may be awarded at the April meeting. A keeper trophy will be awarded to the recipient at the time that the perpetual trophy is presented. The trophy will be held for one year and returned to the AIOC executive to be awarded at the April meeting. In case of a tie, the winners shall equally share in the award with regard to the number of months held, names recorded on the perpetual trophy, and receipt of the keeper trophies.